This is a garden gate I have just finished as a commission. It is made from ash which has been cleaved (split) to follow the natural curves of the wood. The right hand side will close against a curved wall, hence the shape. 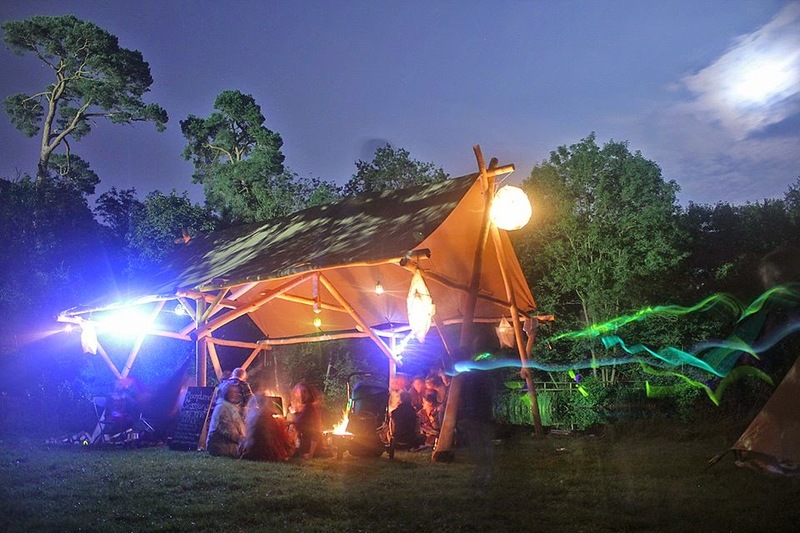 This summer Jacob Lambert and myself decided to build a roundwood timber framed structure that could be disassembled and transported, to be used as a flexible space for events and as a showcase for roundwood timber framing. Its first unveiling would be at Shambala Festival in Market Harborough. Initially the plans were to create an octagonal structure, but worries about getting a fitted canvas made within the three week window that we had available, made us opt for a rectangular structure with pitched roof. However, we were still interested in experimenting with less conventional styles of frame, as most roundwood structures we had seen were based on A-frames, and we were sure that other styles would also work with this vernacular. An important factor in our design was that there be no posts sitting within the footprint of the structure as we thought these would interrupt the space and make it less practical. The design process was ongoing throughout construction, with many alterations being made along the way. The frames were constructed in the woods that I manage, using Ash and Poplar for their lightweight properties and availability. Although these woods are not particularly durable when exposed to the elements, this will not be an issue as the structure is taken down and stored inside after each event. The photo on right shows timbers being worked on the framing bed. I (on right) am using a 'stab axe' - a kind of slick chisel to flatten the sides of a tenon on one of the poplar posts. Poplar is lovely to work with edged tools. The structure consists of three independent frames which are then joined together with horizontal wall plates and a ridge pole and then braced diagonally. The two end frames are modified A-frames which we called 'star frames' due to the diagonal bracing that supports the ends of the horizontal of the A. 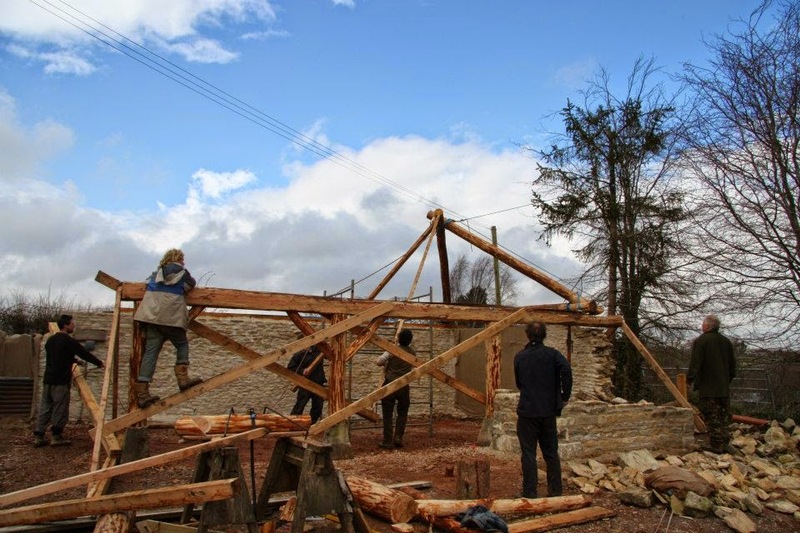 The central frame incorporates a number of elements of traditional timber framing design including upright posts, interrupted tie-beam and king post. It is essentially a truss frame except the vertical posts form an integral part of the frame, rather than the truss sitting on a wall plate on top of the posts. The king post was made from a natural fork that we then hewed square to reduce its size and to form a bit of a feature. The interrupted tie-beam raises up the bottom of the king post so that people don't bash their heads on the pretty little pyramid at its base. Diagonal bracing on and guy ropes removed. Its a free standing structure! The frames were bolted together and then covered with false pegs made from oak (shhh...) to allow it to be taken apart with relative ease. The canvas for the roof was made by Roland at Custom Canvas Structures - a friend of Jacobs who makes beautiful marquees and tents. 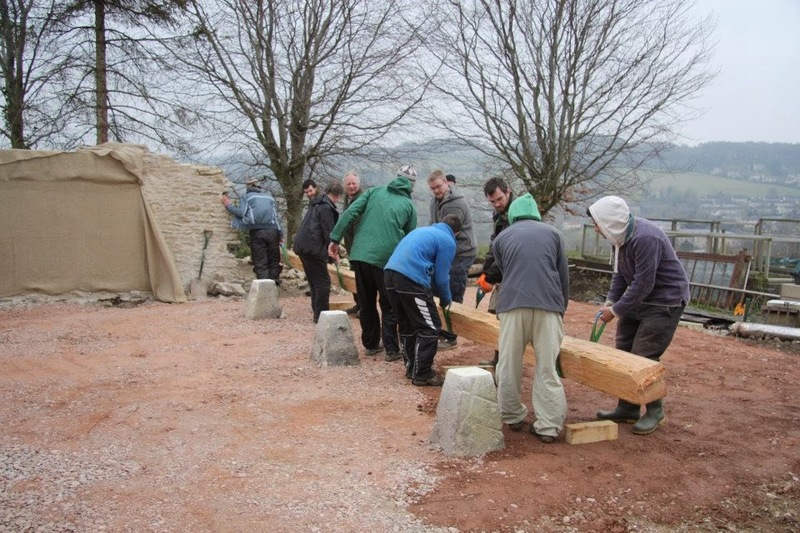 Big thanks to Mikey Pea and Pumpkin who helped us construct the frames in the woods and to Pedallers Kitchen crew and especially Stevie and George who were invaluable during the onsite construction process. During the festival it was used as a workshop space and hosted folk sessions during the evening. The structure is available to hire for events. It measures approx. 6.5m x 5.5m. We are planning on creating woven wattle and canvas side panels to allow the structure to be more enclosed when required. We can also build permanent roundwood timber framed buildings. Email p.ditchfield(at)yahoo.com for enquiries. In April last year I was involved in building a large outdoor kitchen at Jamie's Farm in Box, Wiltshire. Jamie's farm is a charity which hosts groups of children for week long residential visits, aiming to help them re-engage with education, with great results. The outdoor kitchen was built looking out over the vegetable garden. This allows food to be picked, cooked and eaten all within a few metres. 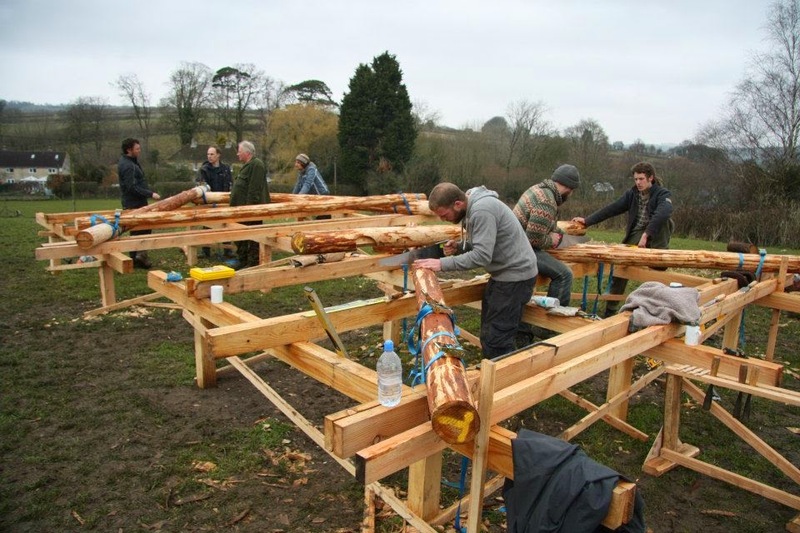 This build was largely done by volunteers - Jamie's farm provided food and accommodation and the Cherrywood Project provided tools, Lloyd and myself, the apprentices at the time, and Tim Gatfield's expertise and project management experience. 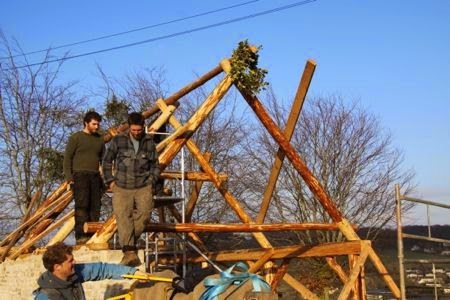 We decided to build it in a week using Roundwood Timber Framing techniques - an ambitious goal seeing as none of us had any direct experience in this style of framing. We managed to rope in Dan Tuckett and Jacob Lambert, who both had some experience in the technique, to help us. Dan had done a short course with Ben Law, and is now, having gained more experience, looking at setting his own green building business, and Jacob, an old friend of mine, had been involved in building the beautiful outdoor classroom at the sustainability centre. Jacob and I are now building roundwood structures together. 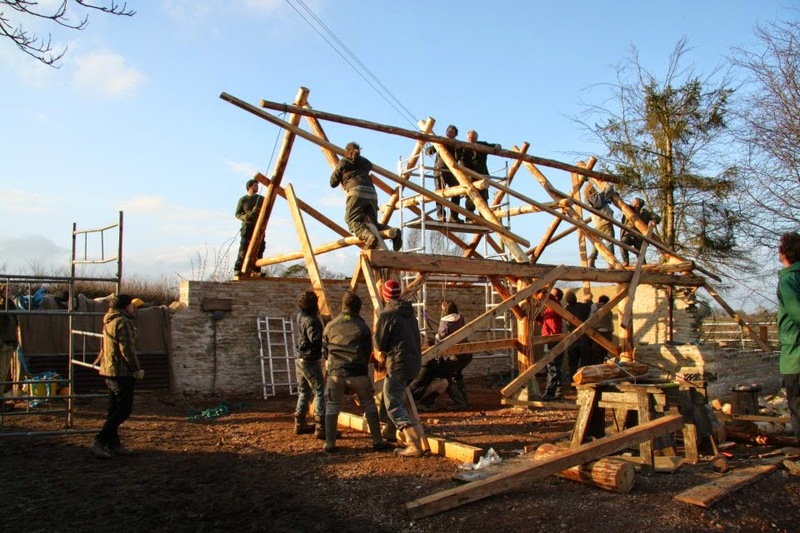 It was a steep learning curve for all of us, especially considering the short time allowed for the build, but we did manage to get all the frames erected and secured by the end of the week. The stucture was effectively a post and beam frame with truss roof, except an existing wall replaced the need for posts or beam on one side. The above photo illustrates how the frames are constructed. The 6"x2" frames are called 'framing beds' and are used to get everything level and accurate and ensure all frames match at the key points. The joints are called 'butter pats' and cup around the opposing log with a 'cog' and a notch fitting together, ensuring a tight, secure fit. One of the joints can be seen in the centre of the above picture. In the end me and Lloyd spent another couple of weeks putting the roof on, cladding the gables, finishing the pizza oven and putting a protective roof over it. All timber came from Cherrywood and was only moved about 3 miles to get to the construction site. This includes the larch cladding for the roof, which was milled at Cherrywood.